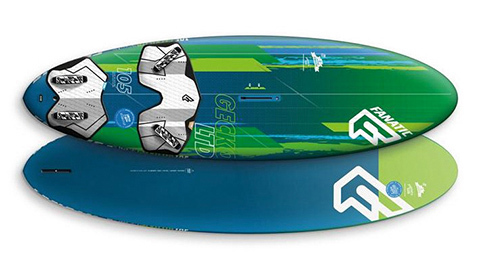 One of the longest yet narrowest contenders in the group, the Gecko 146 boasts new “stylish and streamlined graphics” in an otherwise unchanged design for the 2016 season and available in HRS, Bamboo or LTD construction as seen here. Conforming to the Gecko concept of a wider and thinner design with less volume, the idea is to provide ease and stability with a “fun feeling beneath your feet”. With plenty of inboard and outboard footstrap options (notably omitting training strap positions), and incorporating heel cushions in the deckpads, the 146 is relatively chunky in the tail, the deck shape being flat through the centre of the board before doming smoothly to the rails. Supplied with a high quality fin and Fanatic’s trusty Velcro straps, the Gecko’s design looks quite conventional compared to some other designs in the group, so it would be interesting to see how it performed. The word that immediately springs to mind as soon as you step on the Gecko 146 is ‘stable’. It provides stability in a couple of very noticeable and defining ways. First of all, it is very safe and easy underfoot, feeling balanced and forgiving of clumsy footwork. Secondly, it is very stable directionally, tracking forwards effortlessly and gaining momentum as soon as power is applied. Both these ‘stability’ attributes combine to make the Gecko a fantastic tutor for the progressing sailor – a dependable and secure platform for guidance into planing wind strengths. Apply the power and it cruises up onto the surface of the water in such an easy, passive manner that it will get even the most timid passenger onto the plane before they realise it! The volume in the tail allows the rider to move back confidently, masking over even baby-elephant footsteps as it maintains its direct sailing line. With plenty of volume and a flat deck throughout its length, the Gecko is one of the easiest in the group to tack, whilst its secure trustworthy nature is present in the gybe as well. It takes a firm carving style to keep rails biting, but commit as hard as you dare and the Gecko will respond. As the wind increased we loaded the Gecko with a high-end sail to test its top end credentials, and whilst reaching a respectable cruising speed, in a drag race we found it wanting. It has a limited top end, and certainly feels its size in choppy conditions, but this is not the 146’s forte. 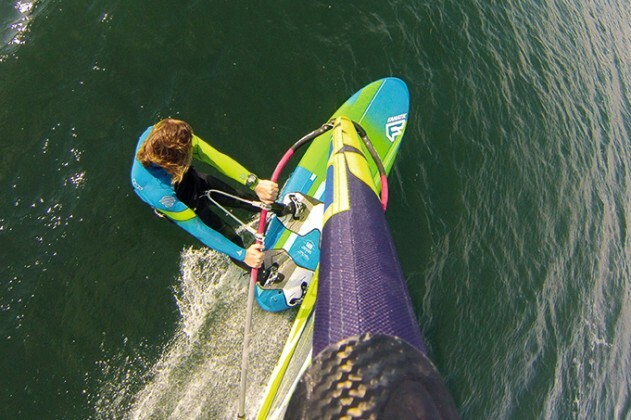 Instead it is a stunning progression board to guide the intermediate rider seamlessly into the world of planing windsurfing. Early to plane and gathering speed with such effortlessly smooth acceleration, the Gecko is a dream progression platform for the intermediate rider.